Effective training (whether it’s dog, kid or self) involves small steps, incremental changes and positive reinforcement for any effort made in the desired direction. I continue to re-learn this lesson in working with Cowboy. I wrote about it last fall in reward the slightest try (part I). There is still so much to learn. So much that I need a part II. Cowboy and I recently had our first formal lesson. What I wanted was a riding lesson — tips on technique and etiquette. What I got was more groundwork — exercises to strengthen the bond and clarify roles for me and Cowboy. 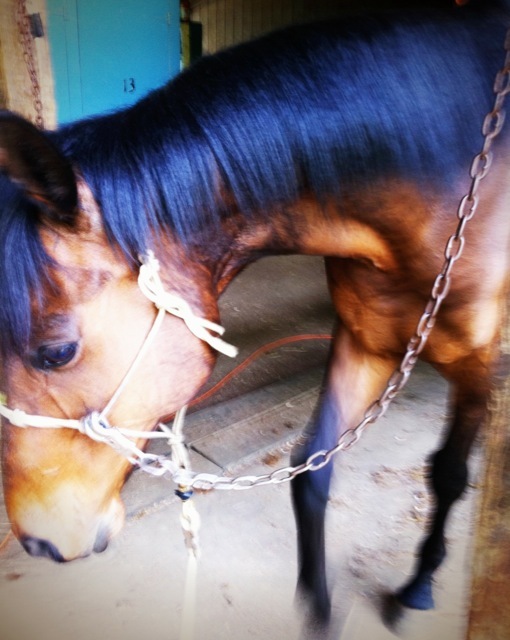 The purpose of one of the exercises is to get Cowboy to lower his head when I’m taking off or putting on his halter. 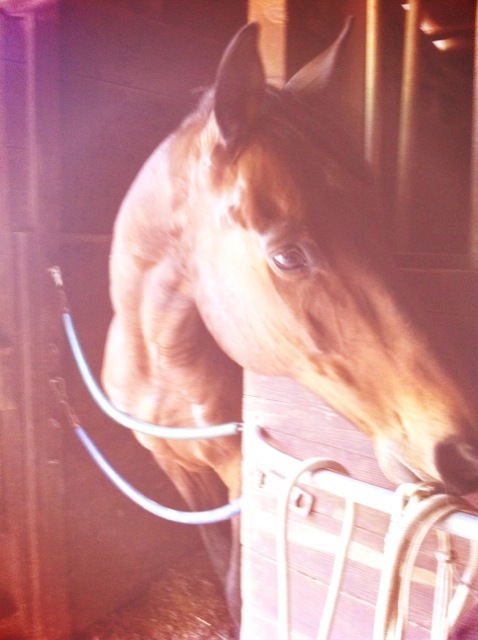 Holding the lead rope where it attaches to the halter under his chin, I give a pull downward. As soon as Cowboy lowers his head—to any degree—I am to release the pressure and let go. The point is not to get him to lower his head down to my waist height on the first try. The point is to get him to lower his head at all. This sounds deceptively simple, but boy is it a hard lesson: to not need to go all the way, to acknowledge small efforts made by him, to literally let go of the rope. By repeating the exercise several consecutive times, his head may end up at my waist height. And by practicing this for several consecutive days, he now lowers his head all way without any pull from me. When the movement in the direction of becoming something other than what you are isn’t there anymore, you are not in conflict with yourself. I keep reading this quote over and over. Each time its texture changes and it reflects a new shade of light. It melts me completely. The freedom of not being in conflict with myself? I can hardly imagine it. To be honest, I don’t know exactly why this quote is so mesmerizing right now. Surely it has to do with vulnerability, it’s definitely related to my little kidneys and it’s about noticing the tendency toward separation — all clear themes in my life right now. I know that when Cowboy offers movement in the direction that I want, I release the pressure on his rope and we are not in conflict. I know that when I am not fighting with him about however he is that day, I am not in conflict with myself. 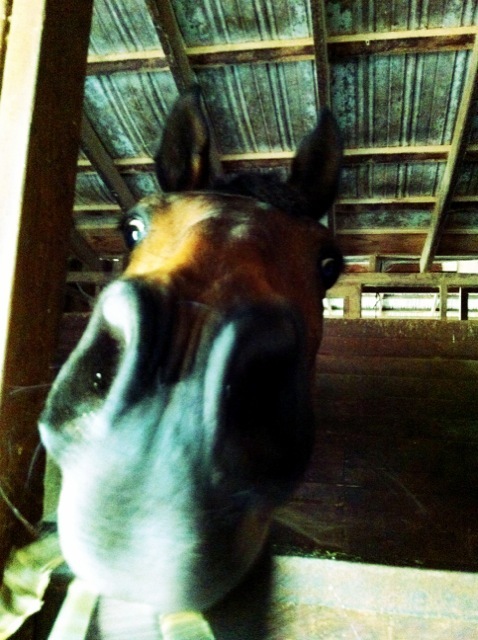 I know that when he’s had enough of me being gooey and philosophical he throws me a face that says, Hey, I’m just a horse. So that’s me. Grateful. A little bit uncertain. 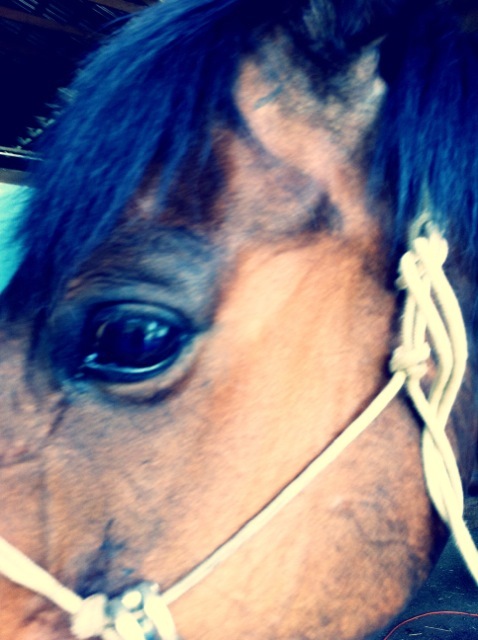 And so in love with this horse! How is it for you to let go? What does conflict feel like? What are you in love with!? One more pic, cuz he’s so pretty. Happy Monday! I love that quote by Krishnamurti, and also the recognition that we are so much like horses. Have you read Mark Rashid’s books? I think you’d like them. Really happy that you have Cowboy, and he, you. This was completely, throat-catchingly beautiful. Love it and love you. I cant stop rereading that quote either. Each time it rolls through my mouth like a flavor I have never tried before and never want to leave. What does that mean to not be in conflict with myself? Wow, I am speechless because.. i simply cannot imagine just a life… Oh how I want that life I do i do! @bridget – wow, even his blog/website are a wealth of info. thank you!! @mad – i am so touched. truly, thank you. @thais – i’m with you, girl. are you ready for a whine? but it is so hard! recognizing the small efforts and successes goes against cultural norms and in my case, a serious family history. not that it isn’t spot-on and totally worthy of effort, but man this is a hard one for me. the ever 3rd chakra pitta driven ball of intensity. sigh. good thing i’ve got everyday to practice a little. I wrote a bit about a Krishnamurti quote with a similar meaning last week – I had so much trouble wrapping my brain around it – this one is more clear to me and your writing and the story connected brings it home beautifully. I love this. Thank you so much. I’d love to link back here if you don’t mind, it’s such a perfect illustration? @mel – yes, please link! thanks for asking. and i’d love to see your post as well! !